We have a very LIMITED SUPPLY of the now out-of-production Tormek T-7 Sharpening System at an unbeatable price. Get yours while they last! Blog: What's Inside the Wood? Considered the "Swiss Army Knife of Woodworking Squares" the Woodpeckers DelVe Square is compact, functional, and provides dozens of uses in your workshop. 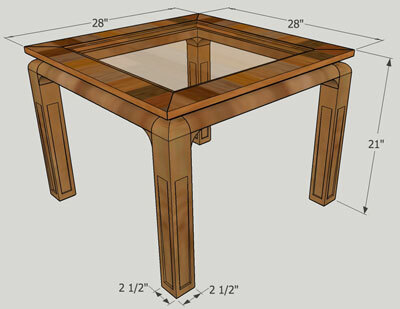 This month, Forrest Bonner is sharing how he made what he calls his "Occasional" Coffee Table project. In this new monthly column the Madcap Woodwright, John McBride, invites both seasoned pro and novice woodworkers alike, to stop and reevaluate their perspective on woodworking. Each month, John will discuss issues that encourage you to explore time worn attitudes and approaches to woodworking. This month we're sharing Bruce Mayfield's two-story shop, where he spends time building toys since his retirement. This month we're sharing woodworking projects made by James Raines, a self-taught woodworker who enjoys making furniture for his family. This month we are featuring wood carving projects made by Jerry Poirier, a retired woodworker who focuses on bird carvings. This month, Steve Johnson discusses how Einstein relates to woodworking, considers how woodworking projects can go in different directions but end with the same result, and describes his newest vestibule project inside his house. This month, Alan shares his tips on using Aerosols when finishing your woodworking projects. Jeff Fleisher reviews the Blue Spruce Toolworks Joiner's Knife and Sloyd Knife , which are both based on the Swedish educational system of Slöjd, a system of handiworks and crafts. This month, Jim discusses the creation of his new mobile grinding station that accompanies the new sharpening center he made last month . David Jones recently came across a downed cherry tree with beautiful burls. 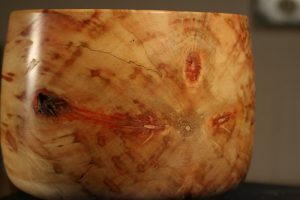 It wasn't until he cut into the wood to make a bowl blank that he found the beauty that had been hidden away inside the downed tree. There are various medium on which to sharpen and hone your plane irons and chisels: diamond plates, water stones, oil stones, ceramic stones, sandpaper and more! In this video from Highland Woodworking, Justin Moon talks about the different choices and pros and cons of each method. This month Jim Randolph asks: "How Do You Sell Your Tools You No Longer Use/Need?" Every woodworker has a favorite way of cutting a dovetail--marking, tools, order of operations. In this article, Amy Herschleb explains the way she learned as a beginning woodworker. Highland Woodworking is the presenting sponsor for this gallery event full of woodworking projects from some of the Southeast's most talented woodworkers, including pieces by two of our employees. This month's discounts include: Weekend Woodworking - Plans and Projects , Tiny Boxes - 10 Skill Building Box Projects , Taunton's Complete Illustrated Guide to Furniture and Cabinet Construction , and The New Turning Wood With Richard Raffan DVD . Take advantage of this great opportunity to learn in person from many of the woodworking masters who regularly contribute to Fine Woodworking magazine during a full program of classroom instruction and technique demonstrations to help you expand your skills.